New Delhi: Haj operations this year will commence from erstwhile international terminal of the IGI airport (T2) here with first batch of pilgrims leaving for Jeddah on October 9. "The erstwhile international terminal (T2) will be used for Haj operations this year. Pilgrims will be able to use specially earmarked areas for offering prayers inside the terminal 2," a DIAL spokesperson said. Special arrangements have been made by the airport operator for the Haj pilgrims at T2. These include eight immigration counters, 10 check-in counters, modified toilets and provision of basic medical support, he added. Around 32,000 pilgrims are expected to travel out of Delhi for Haj this year. The first batch of pilgrims will leave on October 9. The pilgrims will return between November 21 and December 22. 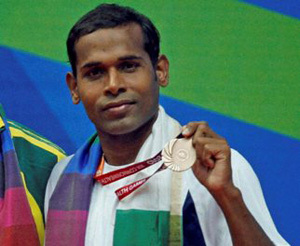 Prasanta Karmakar on October 06, created history by becoming the first Indian para-swimmer to get a medal when he claimed bronze in the 50m freestyle event at Dr. SPM Acquatics Complex in New Delhu. Clocking his personal best of 27.48s, Karmakar finished behind Simon Miller of England (26.70). Matthew Cowdrey of Australia bettered his own timing to create a world record in the same event.